Brooke is an attorney focusing her practice in the area of family law. Brooke represents clients with all types of family law issues including: divorce & legal separation; child custody; child support; parenting time; paternity; post-decree modifications & enforcement (including contempt actions); guardianships; emancipation; relocations; and protective orders. Frequent communication with her clients, keeping their goals a priority, and thorough preparation are the foundation of Brooke's practice. Brooke earned her Bachelor of Arts from Indiana University Bloomington in 2008 majoring in history, political science, and criminal justice. Brooke earned her Doctor of Jurisprudence from Indiana University Robert H. McKinney School of Law in 2011. Brooke is admitted to practice before the Indiana Supreme Court, the Indiana Appellate Courts and the United States District Courts for the Northern and Southern districts of Indiana. 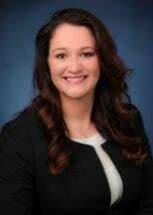 In addition to her family law practice, Brooke serves as a CASA with Child Advocates in Marion County on behalf of children. Brooke is also a member of the Indiana State Bar Association and the Indianapolis Bar Association.